This amazing home is nestled in an exclusive, quiet subdivision, Lake Cresent Hills. 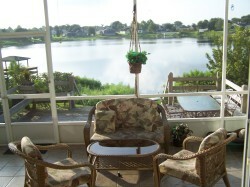 The home overlooks Lake Katherine and has access to the Chain of Lakes(approx. 14 lakes). You can enjoy a cup of coffee in the breakfast nook or the screened in lanai overlooking the lake and enjoy the sunrise or barbeque dinner and relax with a cocktail after the excitement of the day. 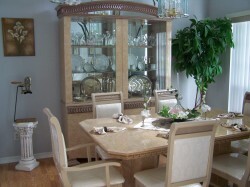 The home is conveniently located to all the amenities for a fabulous vacation. Including fantastic golf courses; shopping; fine dining, family dining & any cuisine your heart & stomache desires; theme parks; nightlife; Lakeridge Winery; famous Citrus Tower; forests; fishing, boat & ski jet rentals and all of the basic needs such as medical care & banking, etc. A chance to see the other side of Florida. The Atlantic Ocean & Gulf of Mexico beaches are aproximately 1 1/2 hours. Once you have stayed in Clermont, it will be absolutely neccessary to extend your vacation!! 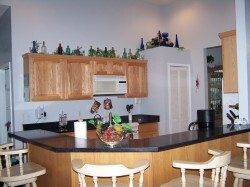 The beautiful kitchen is fully furnished with all the modern conveniences you could ask for. There is a breakfast nook, breakfast bar, elegant formal dining area and a table on the huge deck for your joice of dining. The master bedroom has a queen size bed, flat screen television with cable, a large walk-in closet and a private bath with a garden tub, oversized shower and 2 separate sinks. One of the bedrooms has a king size bed and the other has a full size bed, both are uniqely decorated and share a bathroom between the rooms. The living room has a large screen televison with cable, full stereo system, fireplace and group seating for relaxation. The sitting room and office has comforable seating for quiet converstions, reading or access to the high speed internet. 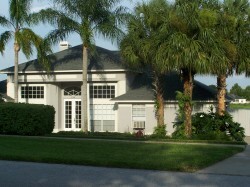 The front yard is exploding with Floridian landscaping for a welcoming entrance.